Hi! As promised, here’s part two of my dressing room session at J.Crew featuring some of the new arrivals from the November 2016 style guide. Admittedly, a lot of these items aren’t translating as November to me but I’m sure people in warmer climates are appreciating some of these items! Some of these items were in the latest website rollout, some are just in the catalog and are new try-ons to me. Regardless, there are some cute items that I would tuck away for warmer weather but…for now I’m looking for more seasonal appropriate items. First up, the Cap-Sleeve Dress in Silk Geo Print. This dress fit similar to the shirting stripe dress that is the same style and I was all to eager to pick that dress up once it went on sale to tuck away for next summer. I’m wearing a 10 and I have plenty of room in this dress. I like the longer length on it as well – it is just about below the knee on me. It’s a thinner silk material and I suppose I could add a blazer and tights but something about it is still screaming summer. The white isn’t stark white – more of a cream color. I also think it’s priced pretty high for what it is. I’d rather pay for a suiting dress that I know I’ll get a lot of work wear out of. Next up is the Silk Button-Up in Geometric Houndstooth. Um…this is the exact same print as the dress, why aren’t we calling it the same thing? Details, details, I know. I’m wearing a 10 in this as well and found the waist area to be a bit tight so I’d probably try a 12 for more of a drapey fit. I have a lot of black and white blouses and this print is just ok to me so this isn’t a must have. I like the covered buttons and the piping detail on the sleeve is a nice touch. The shirt looks a little bunchy on the bottom – it’s a combination of the shirt needing to be steamed and it being a tad tight on my hip area – it should lay as a regular button down shirt. Of course, I see stripes, I have to try it. This is the Striped Boat Neck T-Shirt with French Logo. I’m wearing a size Medium so I’d say it’s slightly generous and you could take the smaller of your two tee sizes. The length was good on me and the sleeves are bracelet length so if you wanted longer sleeves you could wear the larger of your two sizes. The print on the front is a velour feeling print. The cotton is a thicker cotton material as well, seasonally appropriate and this would be cute under a blazer as well. Next up, the Ruffle-Sleeve Top in Navy. 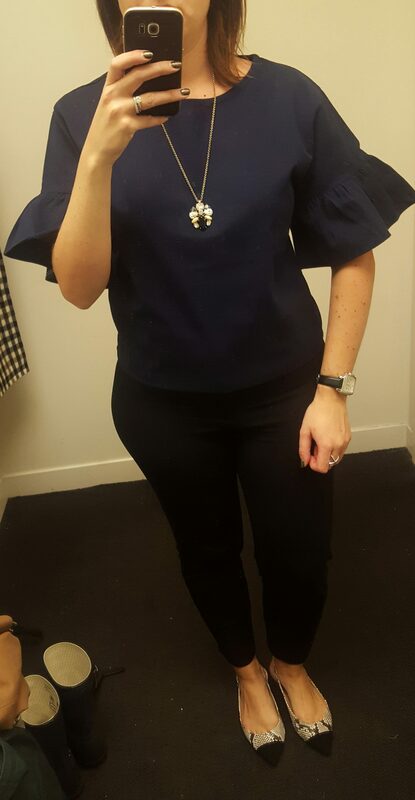 I would have liked this top in black or white (I know, boring) to liven up an outfit – paired with jeans for a casual Friday night out (because for me – casual is ruffle sleeves…hehe). It is a stiffer cotton material and I am wearing a medium, so it runs generous. I know the ruffle / bell sleeves are on the trendy side but I like that these are a little longer and less flouncy than some I’ve seen if that makes any sense. This also comes in a lilac colorway. I think there’s only so many of these that can make their way in to the closet. I have the striped tee from late in the summer with less of a ruffle, which I have worn to work. This reads more of a weekend top. Next up, the Metallic Chiffon Top in Ditsy Floral Print. Again, this looks like a spring top. I was skeptical of this top when I pulled it off the shelf (this is also not a new release). The top seemed a little short and wide on the hanger but it had a better shape once I put it on. I’m wearing a 12 in this which I think I needed due to the shape of the blouse. It’s still a little dowdy though, in my opinion. The print is very pretty though with light blue and flecks of gold. Last up, the Checkered Flutter Dress. I would have liked to try this dress in my size but this is a 10 and definitely a little snug. Flare skirt dresses/skirts are usually hit or miss for me (and mostly misses) but I think had this actually fit me I would have liked it. I am not sure how much length I’d get out of a larger size though, and I would like a skirt like this to at least hit my knees. So, that’s it for now…I’m looking forward to holiday rollout in a few weeks! Would love to hear what you think and thanks for visiting!